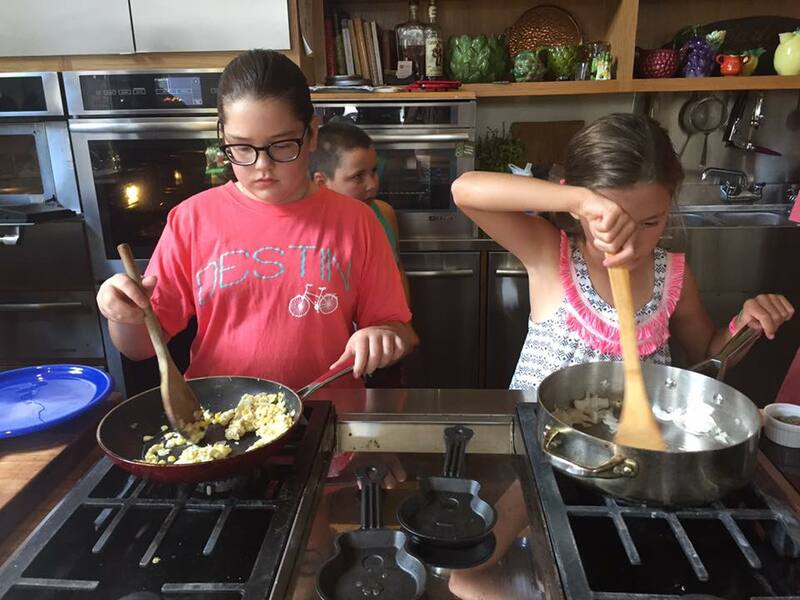 This summer was my fourth year directing the SoFAB Kids Culinary Camp, and each year we have more in terms of experience and literal appliances to offer the kids. This year was no exception. The team of interns this year were truly the backbone of the summer. Mary Clay Kline, a senior at University of Alabama, came in and led cooking each week, while working nights at Shaya, and the culinary risks she took were SO much fun for the kids; from brownies in hot fudge to shakshuka. Alexa Christianson and Audrey Scandurro came to us from Tulane, both with Public Health majors, and created engaging crafts and games to make sure the kids were getting to stretch their legs and their creativity in addition to cooking. Nick Berray and Jake Young, both from Duke University, brought in the educational and history portions to our days, and were solid guides for the kids through games, lessons, and cooking activities. We also had the pleasure of hosting our first ever Junior Counselor. Ben Aiges was an immense help, from documenting camp to running stations, and (most importantly) washing a whole bunch of dishes during camp so the load was lessened at the end of the day. Ben was simply amazing and rose to the challenge, showing a hard work ethic and great enthusiasm. This year the kids worked with more appliances than ever before, they played well-loved games like Chopped each week instead of every other week, they exhibited immense teamwork at their tables, creativity in the kitchen, and a willingness to experiment with their palate. We had some struggles, like two revolving broken dishwashers, an incessantly clicking pilot light, a fickle induction burner and a couple of instances of burnt rice or underdone desserts, but it was nothing in comparison to the joys. We had kids who became friends at camp and went home to cook together afterwards. We had kids who staunchly refused to eat certain foods (or eat at all in some cases), and saw them grow, trying tiny tastes and finally admitting that they liked something they normally didn’t. In reverse it was the coolest thing to see the kids who were already confident food explorers encourage their table mates to be bold and try new things! The Middle School week was a lot of fun because it’s so unique. The kids have the dexterity and know-how to do prep and cook on the same level as beginner adults, so coming up with New Orleans restaurants as our theme was a great direction to go because I certainly learned how to make things I never would have attempted normally. We made mock (alligator…because turtle apparently isn’t in season) turtle soup from Commanders Palace (including having them try it with sherry! ), pita from scratch for Shaya, and Roquefort salad and Baked Alaska from Antoines! We also had a whole day devoted to the camp favorite: Chopped! The teams had three rounds, and had to make three dishes. Needless to say, at the end of it we were all exhausted and ready to never wash another dish again, but it was a satisfying sort of exhausted where you know that the 150 kids who came through our doors got the very best experience we had to offer. Check out recaps, pictures and recipes in On the Line, our blog. Speaking of Chopped, because it was such a popular game during the summer, we decided to kick off our fall programming, called Kids in the Kitchen, with a class of it! We had 5 teams, and 18 kids altogether, who each got a basket full of traditional picnic items they had to use to create a new main dish and dessert. The items included were: cold fried chicken, potato salad, corn on the cob, and a slice of cherry pie! The kids were able to use pantry items like butter, cream, flour, eggs, and onions in addition to a variety of spices. We had some pretty bonkers things as the final presentation, but yet again I was blown away at how the kids worked well together. Many teams didn’t know their other teammates and had to suddenly come up with a with a whole new dish to be judged in a mere 30 minutes! The circumstances are “savage” (to use a hip new term the interns taught me this summer, for things that aren’t really savage at all but in fact slightly difficult), but each team did an amazing job of coming together and exhibiting exceptional teamwork. The winning team made muffins out of nowhere and every team was running down to the wire. It was such a fun time, and I think the kids had a blast jumping into the school year with a proven favorite. This fall will bring a lot more fun so keep an eye to our Kids in the Kitchen calendar as we fill them with events and cooking classes for your kids!